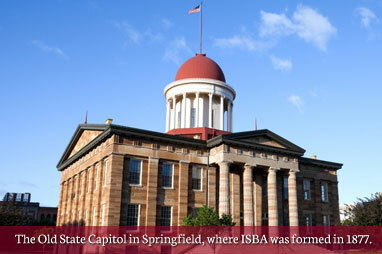 Founded in 1877, the Illinois State Bar Association is the premier legal association in the state. As a voluntary organization of 28,000 members, the Association's primary focus is to assist Illinois lawyers in the practice of law and to promote improvements in the administration of justice. The Association engages in many important activities on behalf of the profession — among them proposing and shaping legislation, educating the public, and supporting the courts and the rule of law. Find out about ways you can give back to the community in our Helping the Community page. Visit our Awards page to nominate that special lawyer for the recognition they deserve. Visit our Diversity page to find out about our ongoing efforts to diversify our profession and organization. Visit our Chicago Meeting Space page to find out more about this space in the heart of the Loop.